Get Well Soon Personalized Brown Teddy Bear - 12"
Wish for a fast recover when you surprise you loved one with this plush teddy bear. 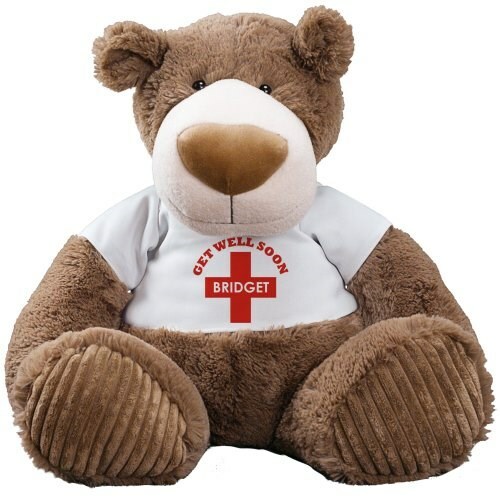 Offering our get well soon design, this plush teddy bear is sure to brighten up anyone's day. Featuring the Aurora classic teddy bear style, Mocha is the smiling teddy bear with an oversized nose. His chocolate brown exterior is pleasantly soft and the corduroy pads on his plush feet feature a velvety texture that is so soft and comfy. Mocha measures 12" tall and wears a t-shirt that may be personalized with any name, for free! Free gift wrapping and a free gift message are also included to create a thoughtful presentation. My sister-in-law enjoyed the personalized bear and made her smile. She had hip surgery. Additional Details Shop our entire Get Well category to find the best plush animals to tell them Get Well Soon.